It’s a foregone conclusion that in this post-Hamilton era, any new media set during America’s Revolutionary War is now forever going to draw comparisons to said musical and its creator, Lin-Manuel Miranda, and more than likely fall short. However, with Declaration #1, Josh Trujillo and Levi Hastings pick up one of the most important directives and legacies of Hamilton–that of writing marginalized groups back into the historical narrative–and they do so admirably. Like Miranda, Trujillo and Hastings belong to this new generation of creators who are writing (and drawing) themselves back into the historical narrative. If you were left wanting by the ambiguously subtextual nature of the onstage relationship between Alexander Hamilton and John Laurens, you will be pleased to know that no such ambiguity or subtext exists between our protagonists, Zacherius and Hiram. The narrative drops us in medias res into their already existing relationship. However coy the summary of the comic might seem, we have our characters already making semi-public declarations of love, which I think is a very smart move when you’re trying to hook a new audience, and I am hoping that we will get the story of how they came together in flashback in future issues. Look at these two nerds. I love them both already and I barely know them. Hastings’ art maintains a graphic feel through the use of color, with some scenes using red, white, and blue while the flashback uses blue, white, and yellow. 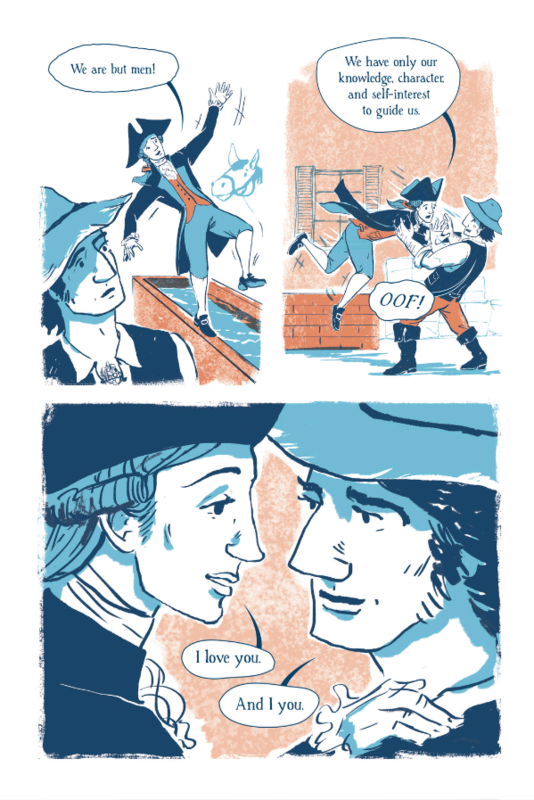 The lack of panel borders and use of white space contributes to this overall feeling of “openness,” and thematically, the blank spaces parallel the unknowns that our young couple (and young country) faces. Their story, and America’s story, is still a sketch at this point; it’s an idea, a suggestion, and the art itself is a representation of that. As we move through the narrative, we, the audience, are already primed to expect class-related conflict between Hiram and the aristocratic Zacherius (who I can only assume owns slaves or at least employs freed slaves, though some kind of clarification would be helpful on that point). Knowing that war is coming means that the reader is also primed to expect hardship and potentially shattered idealism on both their parts, which makes me a little concerned for their happiness. 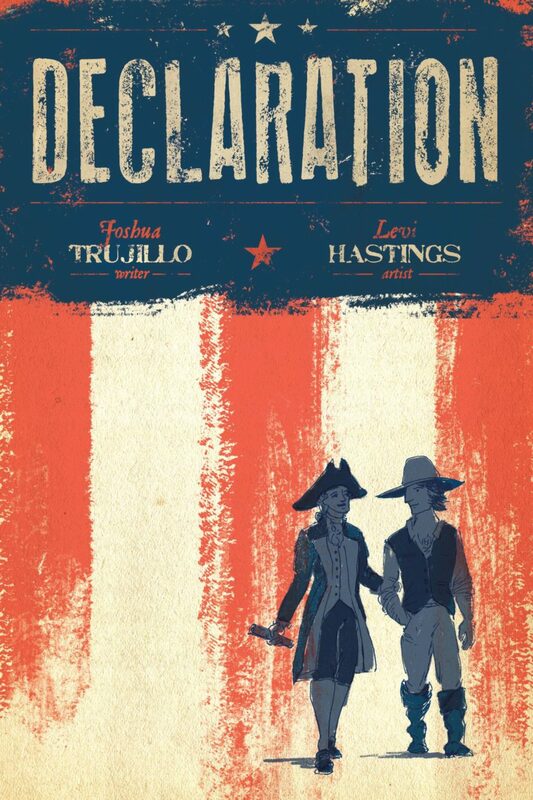 So I just want to take a moment to plea to Trujillo and Hastings for a happy ending, if they don’t already have one planned, because queer romances in historical settings that end happily are few and far between, at least outside of fanfic. My one criticism of the story as presented is that it is unclear where in the colonies our story takes place. I understand that not naming a location creates a sense of universality, an implication that the story could take place anywhere, but there was a huge amount of difference between the colonial experience, and especially the wartime experience, in the northern colonies than in the southern, not the least being the issue of slavery. So I hope that this is clarified in some way. Honestly, putting a little red star that says YOU ARE HERE on the map of the colonies that serves as the frontispiece of the comic is all I’m really asking for, and that’s a small criticism in the context of a story that has a much larger importance, culturally, socially, and historically. As the world moves away from election season and political burnout, Declaration #1 works as a restorative. I first thought the fact that it was released a week before Election Day seemed like poor timing, but having read it, I now think that its timing only reinforces its message that politics don’t stop mattering just because an election is over. The ideals of the American Revolution don’t stop mattering because we live in the 21st century instead of the 18th. It reminds us of the hardships of the past and the optimism of not only the founding fathers, but of everyday men who would become Americans–and yes, some of them were in relationships with other men, just as some Americans are today. Declaration #1 reminds us that the past is present, that historical narratives matter, and the reclamation of those narratives is ongoing.